Alastair Somerville is a sensory design consultant. He provides specialist advice on wayfinding, cognition and user centred design to companies and public organisations who provide both physical and digital services. 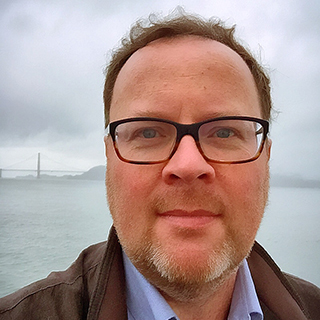 He facilitates workshops on sensory and emotional design for corporations, including Fjord and Google, and major conferences, including SouthBy Southwest (SxSW), UX Week, Interaction and O’Reilly Design. He also provides workshops on person-centered design for dementia and other cognitive impairments. A workshop on designing for mixed realities. Using both play and physical exploration of places, this workshop first provides a human-centered model for design for personal perspectives and perception. The workshop then shows ways in which existing UX and Service Design tools can be augmented to manage product development when users are encountering multiple layers of information thru augmented and virtual reality technologies. This workshop is about becoming comfortable with the extended spaces we all live in now and then how we can successfully manage products for users who are moving thru Mixed Realities. The concept of jobs to be done provides a lens for understanding value creation. It’s straightforward principle: people “hire” products to fulfill a need. For instance, you might hire a new suit to make you look good at a job interview. Or, you hire Facebook to stay in touch with friends. You could also hire a chocolate bar to relieve stress. Viewing customers in this way – as goal-driven actors in a given context – shifts focus from the psycho-demographic aspects to needs and motivations. Although the theory of JTBD is rich and has a long history, practical approaches to applying the approach are largely missing. In this presentation, I will highlight concrete ways to apply the jobs to be done in your work. This will not only help you design better solutions, but also enable you to contribute to broader strategic conversations.